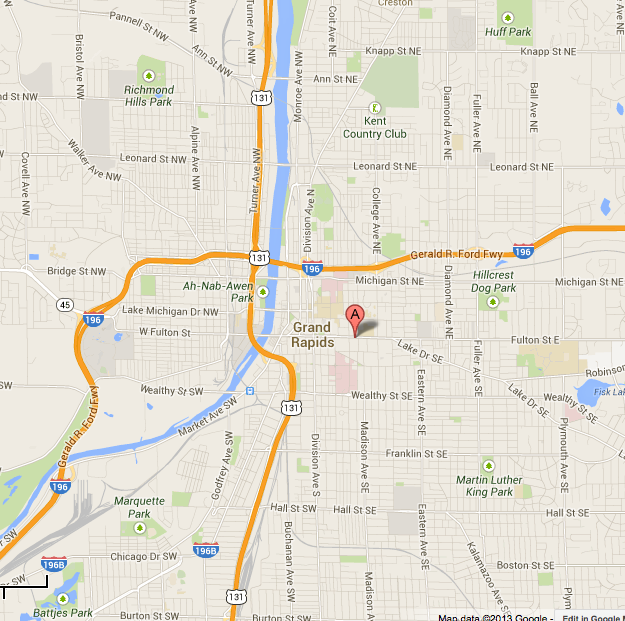 If you need help with directions, please call us at (616) 458-3694 or (800) 345-1393. Please Note: Our building does not have a Heritage Clinic for Women sign on it. It does have the number ‘320’ in very large numbers above our front windows. Please pull into our driveway and park in our lot in the back of our building. Our patient entrance is on the side of the building where our driveway is located. If our back parking lot is full, please do not block other cars in or park in our driveway. We recommend that your driver drop you off at our side entrance and park on a surrounding side street. Some parking spots are metered for a maximum of one hour and others are not metered. We recommend that you consider the temporary street parking and have your driver move your car to our lot as soon as space is available. You may encounter one or two peaceful, anti-abortion protestor(s) on the sidewalk in front of our clinic or in our neighbor’s parking lot in the back of the building. They may offer you written information and want to talk with you. The anti-abortion protestors have been known to say things that are insensitive, inappropriate and inaccurate to women entering our building. We would rather you not expose yourself to the protestor’s agenda on the day of your abortion when you need the clearest, most respectful, unbiased support. We recommend you express any thoughts, feelings or concerns you may have about your pregnancy or your abortion decision with our staff rather than the protestors. Our pro-choice counselors are prepared to review all of your options, provide sensitive support and respect your ability to make a wise choice. Take the Pearl Street Exit. Do not turn onto Pearl. Go straight through the light at Pearl, merging into the middle or right lane to avoid getting back onto the expressway via the on ramp. Go to the next light that will be Fulton. Turn left onto Fulton. Once you are on Fulton, you will go over the Grand River, past the Van Andel Arena, through downtown then up a hill. There is a light at the intersection of Fulton and Lafayette on the hill. Go through the light at Lafayette and turn right into the second driveway past Lafayette (our clinic is in the third building on the right past Lafayette). Take the Wealthy St. Exit and turn right onto Wealthy. Go to the light at the first full intersection and turn left onto Division. Take Division to the third light and turn right onto Fulton. Take the College Ave. Exit and turn right onto College. Go to the fourth light and turn right onto Fulton. Our building will be on the left, two blocks down, between the cross streets of Prospect and Lafayette. Our driveway will be the second driveway on the left past Prospect. If you reach the intersection of Fulton and Lafayette, you have gone too far. If you are traveling west on 96, go past the East Beltline Exit then veer to the left onto 196 toward Downtown Grand Rapids and Holland. If you veer to the right, you would be going toward Muskegon and you will miss the Fuller Exit. Once you are on 196, the first exit will be Fuller. Take the Fuller Exit and turn left onto Fuller. Go to the third light and turn right onto Fulton. Go through the third light (College) and begin down a hill. Our building will be on the left, in the second block past College, between the cross streets of Prospect and Lafayette. Our driveway will be the second driveway on the left past Prospect. If you reach the intersection of Fulton and Lafayette, you have gone too far. Turn west onto Fulton. (If you are coming from the North, this will be a right turn and if you are coming from the East, this will be a left turn). Travel down Fulton approximately 2 to 3 miles until you pass the light at the intersection of Fulton and College and are traveling down a hill into downtown Grand Rapids. Our building will be on the left, two blocks past College, between the cross streets of Prospect and Lafayette. If you reach the intersection of Fulton and Lafayette, you have gone too far.